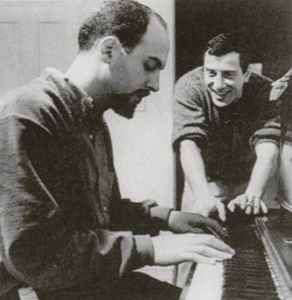 Jerome "Jerry" Leiber (born April 25, 1933 - died August 22, 2010 from cardiopulmonary failure) and Mike Stoller (born March 13, 1933) are among the most influential songwriters and music producers in post-World War II popular music. Starting with the The Coasters in 1957, they created a string of ground-breaking crossover hits that are some of the most entertaining in rock and roll by using the humorous vernacular of the white teenager sung by a black group in a style that was openly theatrical rather than personal. These are songs that include "Young Blood", "Searchin'" and "Yakety Yak". They were the first to surround black music with elaborate production values, enhancing its emotional power with The Drifters in "There Goes My Baby" and influencing Phil Spector who worked with them on recordings of The Drifters and Ben E. King and went on to form his own company and create his famous "Wall of Sound". Leiber and Stoller went into the record business and, focusing on the "girl group" sound, releasing some of the greatest classics of the Brill Building period. They went on to write the successful and iconic hits "Hound Dog", "Love Me", "Loving You", "Don't", "Jailhouse Rock", and others for the "King", Elvis Presley. They were inducted into the Songwriters Hall of Fame in 1985 and Rock and Roll Hall of Fame in 1987.